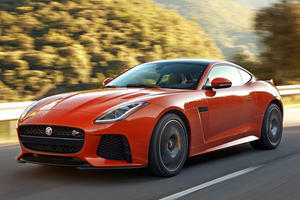 The car the F-Type was always destined to be – the coupe. A 2.0-liter turbo four cylinder kicks off engine proceedings with 296 hp, but if that’s not to your liking, a supercharged V6 can be had with either 340 hp, 380 hp, or 400 hp. Rear wheel drive is standard on most models with an 8-speed automatic gearbox, though certain engine derivatives can be had with a manual gearbox and all-wheel drive. The 400 Sport, in addition to extra power, features the Sport Design Pack, with dark grey and black accents, black brake calipers with yellow 400 detailing, and 400 branding on the bumpers. Though the F-Type first debuted as a convertible back in 2013, the C-X16 Concept that precluded it by 2 years was its biggest contributor in the styling department. That concept was a coupe though, and it shows that even though Jaguar led the charge with a drop-top, the F-Type was born to be a coupe – the proportions just so, the flowing lines and crease meeting in all the right places to make the coupe one of the most beautiful sports cars of the 21st century. 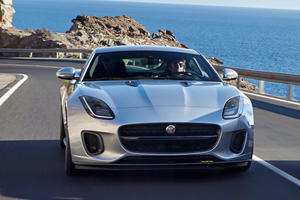 The F-Type takes on the established sports car hierarchy, straddling the border between the 718 Cayman and 911. With those targets in mind, it needs to be very, very good! The F-Type coupe, unlike its open top brethren, is a snug fit. Though despite quarters feeling snug, they aren’t short on space – particularly for taller drivers who’ll still find ample head room. Sitting low in the two door coupe – one whose ingress and egress can be tricky – the high waist line and transmission tunnel envelop the driver into the machine for a proper ‘man and machine as one’ experience. Looking forward, visibility is decent, though the hood is long. Rearward visibility is awkward though; the massive windscreen installed at a low angle narrowing the viewing aperture. However, the F-Type does feature a fair amount of stowage space, with the rear deck-lid opening sideways and the rear deck affording enough cargo volume to fit a full set of golf clubs. 14.4 cubic feet of cargo capacity also isn’t half bad either – enlarging upon the convertibles 11 cubes. Though the F-Type here may be a base level supercar, the 718 Cayman against which it stacks up is one of the most highly accomplished sports cars around. Compared to the Porsche, the F-Type feels more of a butcher’s cleaver than a scalpel. That’s not to say it’s bad in comparison, but it lacks the same finesse. It’s still sharp, but there’s a bit more weight behind it and it requires a little more manhandling. 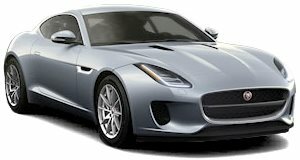 In all fairness, a front-engined sports car will never achieve the balance of a mid-engined one, though the fact that the 4 cylinder and V6 models are lighter than the bigger V8 models (we handle those in another review) makes the entry level F-Type arguably sharper than the more powerful models. The heavily weighted steering is a setup that oozes feel and drips feedback like honey – and the lack of clinical precision gives the F-Type some character that many buyers will thoroughly enjoy. The F-Type coupe gets a decent list of equipment as standard, with three trim lines available – base, R Dynamic, and 400 Sport – the latter only available with the 400hp V6. Standard features include automatic climate control, auto-dimming rear-view mirror, leather and suede upholstery, and a 12-speaker Meridian sound system with options like keyless entry, adaptive headlights, and 12-way power adjustable seating. There’s adjustable ambient lighting too. As for safety, the F-Type gets ABS brakes, stability and traction control, on all models, with a rear-view camera, front and rear park sensors, and rear cross traffic alerts available too. Jaguar To Be Acquired By The French? PSA wants to have a luxury brand in its lineup – and it has its sights on Jaguar Land Rover. Say goodbye to the V8 and V6? 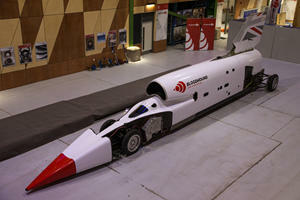 Bloodhound wants to begin high-speed testing “as soon as possible,” with a goal to break the current land speed record.